It was cold and windy! That's the best way to describe the Mar 17 TARC launch. We set up in the soccer fields next to the parking area, which saved a lot of hauling through the snow. There were 4 teams and 6 launches total and we were taking everything down by 3:00. Mar 31 was a lot better. Still a bit windy but the snow was gone and nice blue skies. We set up in our normal area this time. There were more teams and several more flights, but still not a lot. There were a couple of good qualifying flights and a couple of loop-the-loop flights. 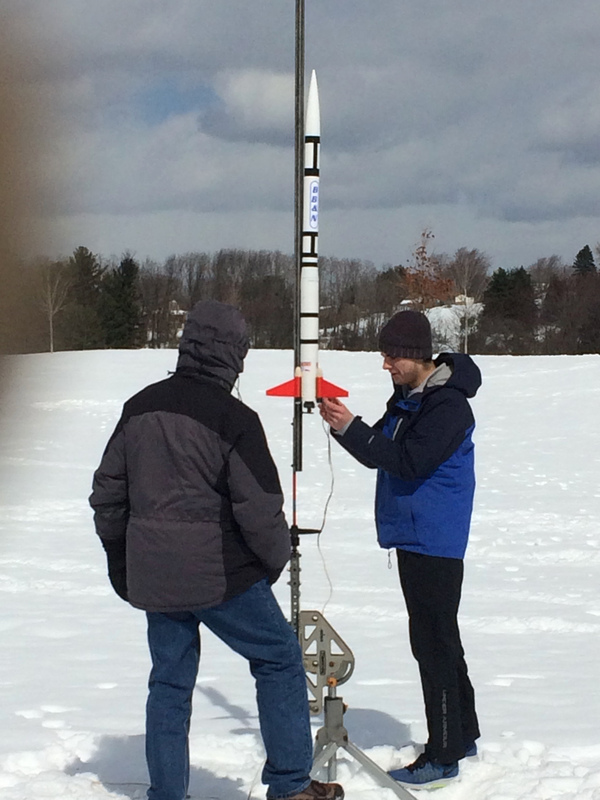 All in all there were five teams that attempted qualifying flights for the two launches, Newton South High School, MIT Lincoln Laboratory, Westborough High School, Buckingham, Browne, & Nichols Schooland Cambridge Rindge and Latin High School. Pictures are in the Gallery.